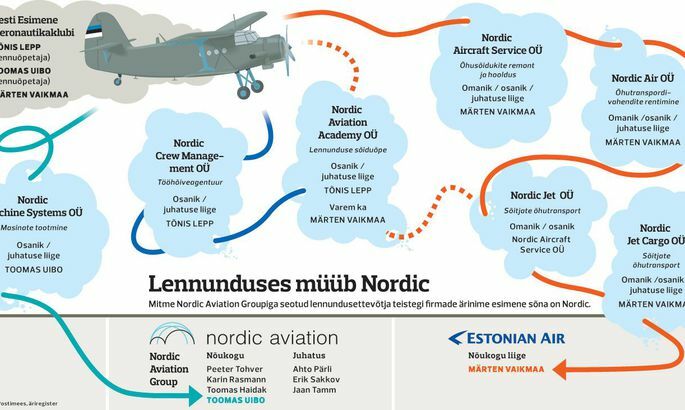 Players involved say the mosaic of aviation companies named Nordic and owned by Estonian entrepreneurs and of Nordic Aviation Group established by the state with €40m is but an optical illusion. In the reorganisation of Estonian aviation, reins were grabbed by entrepreneurs linked to now extinct First Estonian Aeronautics Club to whom belong a total of seven firms named Nordic, six of which are in aviation biz. By name and area of activity, aviation firms of Estonian Air council member Märten Vaikmaa and his friend Tõnis Lepp would fit as core companies of the holding enterprise Nordic Aviation Group created by the state. To Nordic Aviation Group council member Toomas Uibo belong the only non-aviation form in the list, Nordic Machine Systems dealing with production of agricultural and forestry machines. But to Mr Lepp, who was active at Mr Uibo’s side as flight instructor in the club, belongs Nordic Crew Management mediating labour contracts between Estonian Air’s pilots and Nordic Aviation Group. The same entrepreneur is training pilots in his flight training firm Nordic Aviation Academy where Mr Vaikmaa only recently still among the owners. Having suddenly risen to Estonian aviation business stardom as Estonian Air council member, Mr Vaikmaa, a shareholder in Saaremaa shipbuilder Baltic Workboats, learned to fly under the hand of the very Mr Lepp and the two are thought to be friends. Of the bunch, Mr Vaikmaa strikes the eye as the most active aviation entrepreneur to whom belong four companies involved in that field all named Nordic. Nordic Aircraft Service, established some two decades ago, deals with repairs and maintenance of aircraft, Nordic Jet Cargo and Nordic Jet with air transport, and Nordic Air focuses on rental of air transportation. Meanwhile, Mr Vaikmaa parried the doubts that he is harbouring a plan to do business by help from the new aviation company. «I do not have any plans to be doing an aviation company with state money as I know better ways to make money,» he added. Mr Lepp, providing services with a company named quite like Nordic Aviation Group, was equally surprised hearing about the new name. With Nordic Aviation Group council member Mr Uibo, he is linked by aviation and friendship relation which he says does not affect business activity. «In addition to Nordic Aviation Group, I offer personnel seeking service to other airlines as well,» he said. Economy ministry said the name Nordic Aviation Group was picked in a hurry as there was a need to swiftly register the enterprise to save the local aviation business. 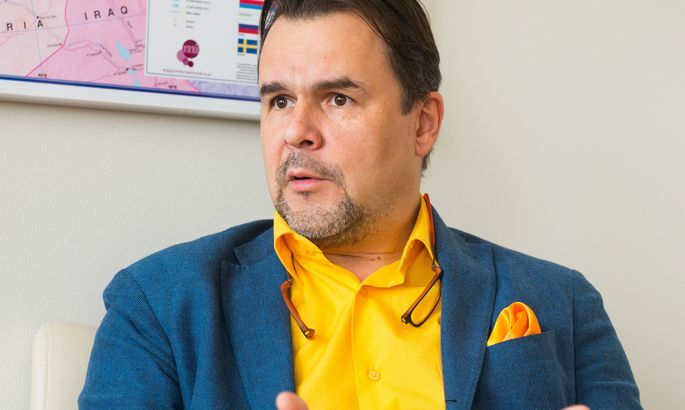 As end of Estonian Air’s operation became obvious, economy ministry’s transportation deputy chancellor Mr Kuningas begun to create a new aviation company. As voluntary experts, he involved Infortar employees Jaan Tamm and Ahto Pärl whose knowledge of aviation were considered the greatest. Earlier, Infortar had expressed interest to acquire. Both men rose to be board members of the new enterprise being created. Established as a holding company, Nordic Aviation Group is currently but a virtual airline which outsources the needed services by blocks. As in the winter the aviation market somewhat slumbers, they found in Slovenia the tiny firm Adria Airways for which rental of their platform provided excellent side business. Also, aircraft complete with servicing crews were found on the market with no major problems. The state’s injection of €40.7m provides the company with capital needed to start, so there is no need to seek a private investor. During 2008–2014, Estonian government made capital payments into Estonian Air and repeatedly bailed the company out by a total of some €130m. In February 2013, the European Commission initiated an investigation into state support for Estonian Air. The board of Estonian Air, a company with nearly 200 on payroll, decided from November 8th to terminate the company’s business operation as pursuant to commission’s decision the airline had been granter state aid in violation to single market, now to be returned. The processes of establishing the new airline went so fast that there may have been merely four minutes to think the new name over. When lawyers called me from the notary’s office, I suggested the name Nordic. Being such a widespread and positively charged name, this must have been intuitive. I would have felt better with Nordic Express, but probably the current name shape fit better. We did also consider name shapes with Estonia, but these did not fit as they may have triggered undesired associations with Estonian Air headed towards bankruptcy. We will alter the company’s name at the first opportunity and to my knowledge this will only cost €350. Let me underline that the hurried rescue operation of Estonian aviation is only half finished and the council desires to select the name very carefully. I would be ready for a faster name change.